Hi dolls I hope you are all having a fabulous week. I am so exited for the Holidays and Christmas is my absolute favorite time of year. There is just so much going on in december between Christmas, My Birthday, Husbands Birthday, New Years so much excitement. I was a very good girl this year and I got my Birthday Present a week early this year. With all the blogging that I have been doing here and will be doing for Sedona Lace I just felt that I wanted more clarity and HD options for my photos and videos. Needless to say Hubby listened an got me an amazing camera. Let me just begin by telling you that with this haul I took some of the pictures with my regular point and shoot and some with my new camera. Again forgive me for not doing my best just wanted to get this out there for you guys and let you in on some of the goodies. Some of these liners are from the Retractable and Regular Liners. Lip Glosses In Love ! What i love most is how Non Sticky they all are! I am really loving all the lippies. Some of the Blusher Duos are a bit blah . The bronzer just isnt’ pigmented enough for my NC40 Skin tone . 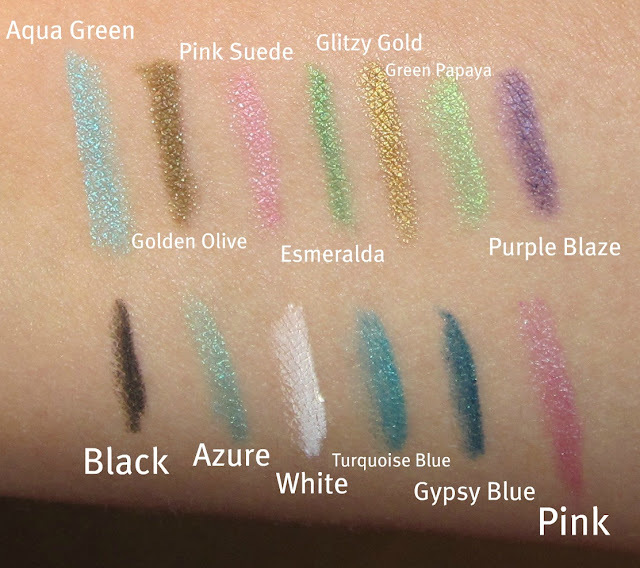 The Eye Liners go on smooth as Butter and have great color Payoff. Hope you all enjoyed! Head on Over to Sedona Lace to see some of my Reviews and Tutorials as there New Intern. Hi love Yay Jersey in the House! I relabeled the Pic for you to make it easier I should have done so from the beginning shame on me. The liners Are great and very comparable to the UD Liners they seem a bit more like the Milani Liquif Eye Liners in my opinion glide on super smoothly and for the price you cant go wrong. Oh and they are Waterproof so great on the waterline! Wow! Awesome haul!!! I need to try some of those liners! You always get the good stuff when you buy NYX! I am a huge fan of this line. I love their lip glosses, lip sticks, their eye primer and eyeshadows. Nice haul! I love your layout btw, I am about to redo my blog to add tabs and stuff. Any advice? @Sweet Surrender. Thanks So much love it was a trial and error with my layout. The main thing I wanted to be able to do is get the tabs and large pictures to display well. I would just suggest to make sure of the layout you pick and it is the one you will absolutely in love with because once you start the process of the personalization it gets super crazy with the codes and what not. i thankfully had a friend help out 90% of the way with my design and layout but have been able to maintain myself here and there. Good uck and let me know If you need any help. @Lisa I love there lip glosses and I remember your haul on your NYX goodies and I drooled when I saw all the blushes! awesome haul 🙂 i looove nyx! what shades did you get those bronzer & blusher combos in?